In 1976 the Viking Orbiter radioed back many images from Mars. Among those form the Cydonia region, one depicted a rock formation that strongly resembled a human or humanoid face staring straight up into the heavens. You can probably guess what was made of this… ‘Pareidolia’ is the term for neurological or psychological phenomena where vague images are interpreted by the brain as specific images. Statistically speaking, it is a type I error, a “false positive”. 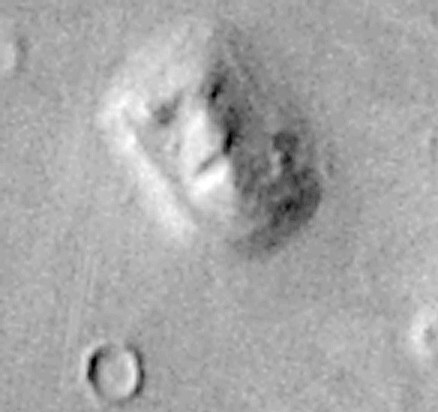 A nice article “Paranormal Phenomena: The Face on Mars: Once and for All” contains some background material on the ensuing kerfuffle, including links to large NASA images of the entire regions photographed. Of course, none of the inevitable conspiracy theories was quenched by the new image. We have a very strong tendency to see patterns in noise – which is often just fine, as seen here.